Tis The Season To Show Your Hubs Some Love. The XD Drive is not new, it has been around for a while now and was developed by SRAM with a lot and I mean A LOT of help from DT Swiss. There is nothing wrong with that, if you are going to get a partner to help with designing a hub it might as well be the “Grand Pooh Baas” of the wheel world. The XD hubs main purpose is to be able to run a smaller cog on the front of the cassette. 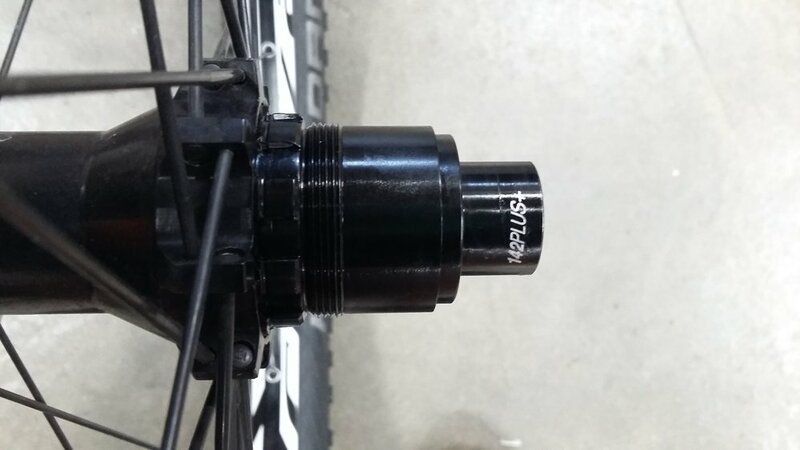 All standard MTB hubs can only go as low as 11t for the high gear, with the XD you can drop down to 10t. It is a completely different design from the standard, so there is no swapping of cassettes between the two, strangely the same cassette tool works for both styles. I only mention this because the bicycle industry is not usually pusillanimous when it comes to introducing new tools, which is why we have 10 tool chests in the workshop, however I digress. The Design of the XD looks very different on the outside but once inside there is no doubting the DT influence. It is basically a DT Swiss Star Ratchet System. This hub is actually quite simple to service. The end caps pull off and once the drive side cap is removed the free-hub body slides free along with the two cone springs and the two ratchet plates. The bearings can be driven out with the appropriate bushings and everything can be cleaned. Simple. The shape of the hub and the relative ease with witch it is assembled does seem to let in a little more of the elements than a traditional design. This is just my opinion based on the many hubs of all designs that I see during the course of the year, I am not even calling it a flaw in the design, it is just “so”. Like all high quality components they do not take neglect and a little regular routine service keeps it all running smoothly. 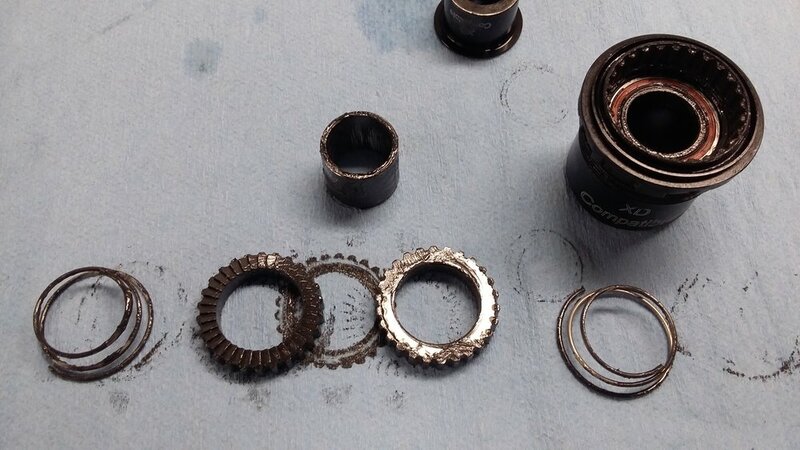 The images below and to the right show a traditional Shimano spline cassette and lock-ring. 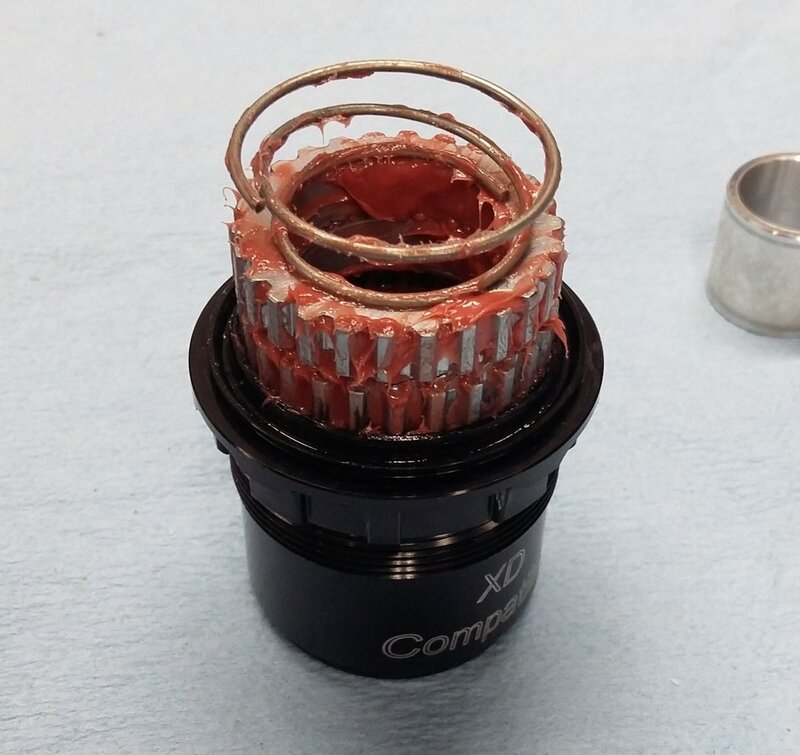 Image to the right shows inside the XD hub after the end caps and the free-hub body has been removed. You can see that a lot of moisture had found its way inside and brought along dirt and grit as well. All that contamination will create an abrasive past and really accelerate the wear. The orange seal visible at the back is one of the two cartridge bearings in the hub body, another two smaller ones live in the free-hub. All of the bearings can be replaced if they are worn. 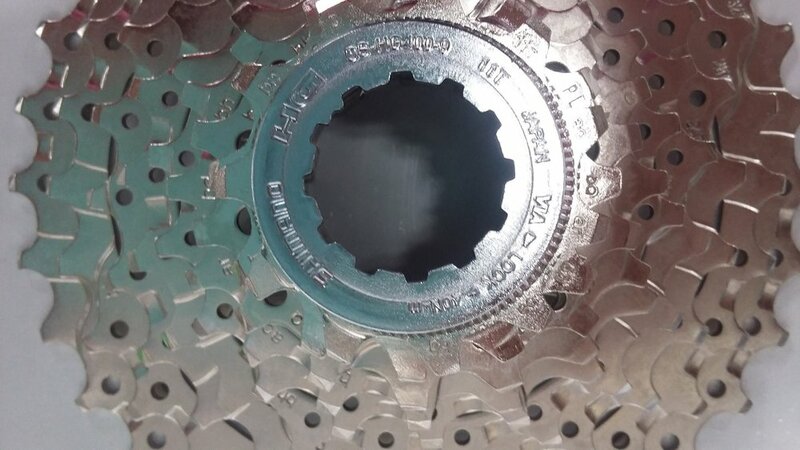 In the pictures to left and above you can see the difference in the design of these hubs, no real lock-ring on the front of the cassette, just the almost hidden standard spline arrangement. A very short tab interface to the rear and the threads also at the back of the hub. The whole of the inner sleeve turns. You can see that there is more openness and moving parts over a traditional cassette. The full horrors of the inside exposed. All the goo is a combination of old grease, water and grit, basically the trifecta of death for any hub. All of this crud needs to be cleaned out and all the parts carefully inspected for damage and wear. Apply a liberal amount of the grease, which actually looks and smells a little like bubblegum, to all the parts and re-fit the free-hub back together and slide back over the through shaft. Do not force it together it should just slide back and flush with minimal effort. If it locks up just twist it slightly and it should all fit together nicely. After some wiping and buffing you should end up with some nice shiny bits and pieces. DT Swiss being the company they are produce a grease for use in their star ratchet systems. We are made aware of the need to apply this grease by the use of the word “Special” on the can… All other lube and grease manufacturers will put very technical names to their lubes, not DT their grease is special. I am a big fan of this type of labeling, I really don’t need to know whats in the stuff but tell me it’s special and I’m in. If I had a grease company my pots would be labelled “Magic Grease”. Anyway The DT stuff is good and works well in these hubs. There we are, job done. Just re-install the cassette and you are ready to roll. Posted on January 4, 2019 by Mark Allchorn and tagged Hubs.